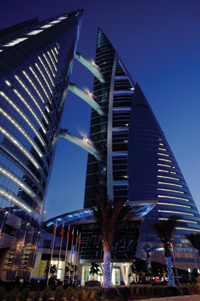 BAHRAIN is to become the Arab Capital of Culture for 2012 and has its sights set on being the region’s official Tourism Capital the following year. The recently appointed acting assistant undersecretary for tourism Nada Ahmed Yaseen said the country’s government is taking tourism seriously. “Tourism is now a high percentage in the national economy and the government is giving this sector its attention because of its impact on the national economy,” she said. Leisure and Mice arrivals to Bahrain during 2009 were counted at 7.189 million, the figure for 2008 was 7.169 million up significantly from 2007 when the country welcomed around 6.5 million visitors. For the first seven months of 2010 arrivals were at 4,405,174, putting the country on target for further growth when the full year figures are released. The primary source market is other GCC countries but the tourism department also wants to woo further European visitors particularly from the UK, France, Germany, Spain and Switzerland and Yaseen is keen to see the Gulf promoted as a single destination – an option which has recently been discussed at national government level. She said: “It is very vital to promote the Gulf as one destination, one product that embraces various tourism aspects to attract a wider range of tourists. “Having a broad array of supply will definitely ensure an increment in the number of tourist arrivals, you will have tourists interested in visiting Dubai or Oman, for instance, coming over to Bahrain as well as it is one product, one package. Speaking on the island’s tourism future, Yaseen said there are plans to market Bahrain as a boutique, short-stay destination, particularly to those who may be visiting the region on business, encouraging them to take a couple of days and experience what the island has to offer. She said: “At this stage, it is best to promote the country as a short-stay or a long-weekend destination – other countries started by promoting themselves as stop-over destinations and now they are well established on the tourism map. “The idea is to attract visitors to the kingdom and get them to experience its products on a three- day package, to enjoy what Bahrain has to offer and gain the will and interest to come back. And she added: “The tourism industry in the kingdom is growing dramatically and with the new hotels opening and future projects the industry will have a more effective impact over the economy. “There are nine international brand five-star hotels and 10 have initial permission to start developing. This is an excellent indicator that the tourism establishments are flourishing. However, we in tourism have to work hand in hand with them to develop our services in order to achieve better. The Arab Capital of Culture is an initiative taken by the Arab League under the Unesco Cultural Capitals Programme to promote and celebrate Arab culture and encourage cooperation in the Arab region. The tourism capital is chosen by the Arab Ministerial Council of Tourism and the designation is aimed at promoting both the destination and its heritage.